A beautiful little parakeet, possibly the best known and most popular bird bred in the world today, is a native of Australia, and the only species in the Australian genus Melopsittacus. It has had a variety of names; Undulated Parakeet. Shell Parrot, Grass Parakeet, Zebra Parrot, Warbling Grass Parrot, Scallop Parrot and Canary Parrot, all of which, fortunately, have been discarded in favor of the original native name pronounced “budgerigar”. It is informally nicknamed the budgie. Wild budgerigars are found throughout the drier parts of Australia, where the species has survived harsh inland conditions for the last five million years. Naturally green and yellow with black, scalloped markings on the nape, back, and wings, breeders have created a rainbow of blues, whites, and yellows, and even forms with small crests. Budgerigars are popular pets around the world due to their small size, low cost, ability to mimic human speech and playful nature. There are two types of budgies - the American budgie, and the English budgie. The American variety is the one most commonly found in pet stores, while type often seen in exhibitions and shows is the English budgie. 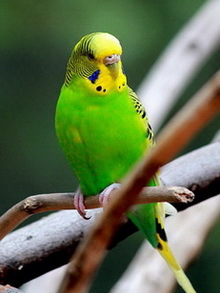 English budgies are larger and have a different appearance than American budgies, but all budgies belong to the same species, Melopsittacus undulatus. © Nature's Scrapbook. Powered by Blogger.